Such antics, whether cool or cringeworthy, have a purpose. Election season is approaching. In April Indonesiaâs 187m voters will pick members of parliament and local and regional legislators, as well as the countryâs president. The battle for the top job is a rematch of the previous poll in 2014, when Jokowi beat Prabowo Subianto, a former army general, by a narrow margin. Serio us policy proposals play little part in Indonesian elections, but identity politics looms large. Religion was a big factor in the presidential race in 2014. Jokowi is perceived to lack piety, a weakness in a mainly Muslim country. Baseless rumours that he is a closet Christian are rife. That prompted him to make a quick trip to Mecca two days before the poll. This time he has chosen as his running-mate Maâruf Amin, the leader of Indonesiaâs largest Muslim organisation, Nahdlatul Ulama. That, the thinking goes, will bolster his Islamic credentials and appease conservative voters. But in this campaign the focus is shifting from conservative Muslims to millennials. In the West, politicians woo older voters, because they are just as numerous as younger ones, and more likely to turn out. 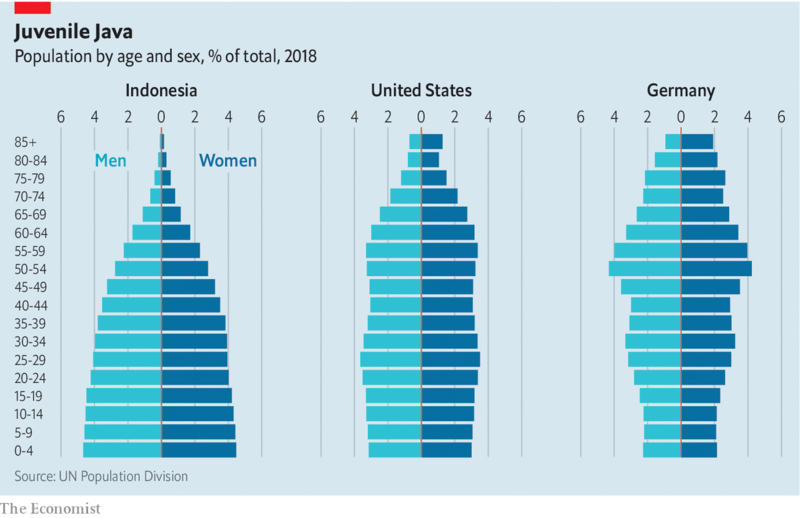 Indonesia, by contrast, is a young country. Its population structure is more like a textbook pyramid (see chart). The median age is 28. About 45% of eligible voters are between 17 and 36. These youngsters will play a pivotal role in the elections. What makes them tick? In some ways they look much like their counterparts in any other country. They spend more time than their elders staring at screens, posting on social media and scouring the internet. Jokowiâs stunts were in part intended to create online buzz and a burst of internet memes. 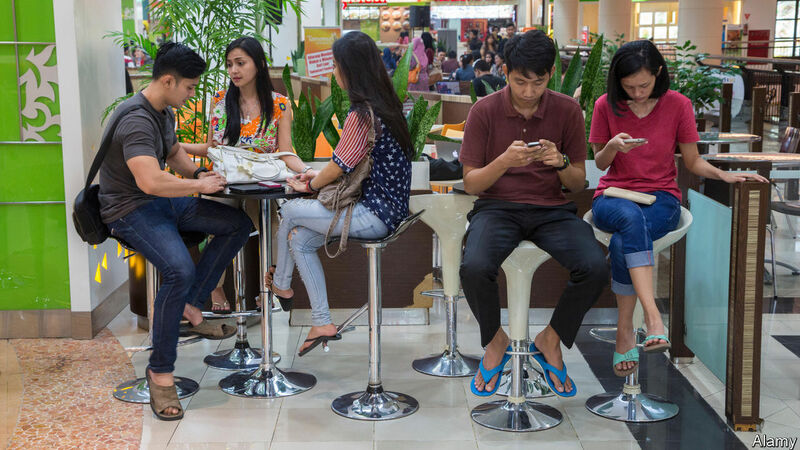 Young Indonesians are more apathetic and less loyal than older folk, says Ali Hasanuddin of Alvara, a research firm. Their turnout in the elections is expected to be lower than the overall figure. Agung, a young barman from Sulawesi, typifies a millennial attitude when he says he cannot see the point of voting because politicians are all the same. In 2014 the youngsters who did vote tended to opt for reform-minded Jokowi. This time things are fuzzier. Pollsters suggest that Jokowi will win again. Survey s give him a lead across all age ranges of 20 percentage points on average. But the gap narrows among younger people. That is partly because of Mr Prabowoâs running-mate, Sandiaga Uno, a businessman who is a sprightly 49-year-old, whereas Mr Amin is 75. Mr Uno exudes athleticism. Last year, when campaigning to be deputy mayor of Jakarta, he promised to build a football stadium and launched his own line of trainers. In September he donned sleek shades and sports gear to cycle around Purwokerto, a town in central Java. Selfie-seekers turned out in force. Unemployment is also a burning issue. The difficulty of finding work tends to top surveys of young peopleâs concerns. The overall joblessness rate is about 5%, but for those under 25 years old it is 16%. They tend to blame Jokowi. In the last campaign he promised growth of 7%. Instead the economy has expanded by about 5% a year. Millennials are hard to please, it seems. The youth wings of most parties are largely ineffective. PSI, a party founded in 2016 to appeal specifically to the young, is expected to win less than 1%. Agus Harimurti Yudhoyono, the 40-year-old son of a former president, ran for mayor of Jakarta in 2017 on a youth ticket but came last with only 17% of the vote. Winning over these all-important voters may take more than fresh faces and pop-culture references.